I've found a great number of really awesome groups and Facebook pages for autistic people and parents of autistic children online, and I'm sure glad for the support and education I've received from them. In fact, I read back through some of my posts from when we were going through the diagnosis process for Curlytop, and realize how uneducated I was, and what an ableist jerk and self-centered parent I was during that time of diagnosis. In fact, I almost acted like the diagnosis changed who she was, and how I would parent her when, in fact, neither of those were true. Remember that we lived nine years with Curlytop before we had a diagnosis, and that diagnosis simply gave us confirmation of what we already knew -- that she experiences the world differently, and her neurological biology is different than many other children's. I'm willing to forgive myself for that ignorance, because now, I know better, so I can do better. But... I've had to leave a number of parent groups, because the parents within them are still acting like ableist, mourning, hand-wringing, woe-is-me, clueless and callous people. Their children have been autistic their entire lives, and yet they're acting like it's the end of the world. Just the other day, I had to block posts from a Facebook page purporting to be autism advocates, because they posted something along the lines of, "We all know autistic children have singular interests. Using a gif, comment with what your child is obsessed with!" The level of overly-broad brush stroking there was unbelievable, and the grossness of sharing your kid's "weirdness" (and making a fun little game out of it!) just turned my stomach. It wasn't even a page I followed, but a "suggested post" from Facebook. The ones that really get me frothing at the mouth, though, are the parents who are still wailing that "autism stole my child from me." 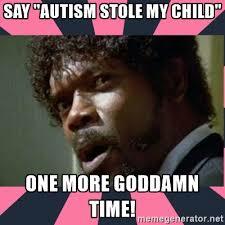 Let me be clear... AUTISM DOESN'T "STEAL" YOUR CHILD. Cancer may steal your child from you. SIDS may steal your child from you. A car accident may steal your child from you. A predator may steal your child from you. A non-custodial parent may steal your child from you. Hell... A destructive cult may steal your child from you. But, autism IS your child. Autism is part of your child's biology, and identity. Autism is something you'd better learn to LOVE, because that means loving your child. By blaming and hating autism, you are, by extension, blaming and hating your child. I get it... parenthood looks different to you than you expected. All those milestones your friends from Lamaze are sharing remind you that your child is different, and will reach those milestones in their own time. Or not. But if you "mourn" that picture you imagined, you are missing the very real opportunity to love what is right in front of you -- your child, who is exactly who and where they are supposed to be, right this very minute, no matter what milestone they are working toward, or skipping. On the real, though... you've been given the amazing gift of a perfectly complex and amazing child. Mourning your child's neurology is like getting a new car, and throwing a spoiled fit because it's the "wrong" color. If life gave you an awesome car, I'd hope you'd drive it proudly, keep it well-maintained so it can perform its best, and cherish the hell out of it. Your child is so much more valuable than a car! If you really wanted a daughter, and your child was born male, would you spend years lamenting, every.single.day, on social media and in "support" groups how much you're mourning for the daughter you didn't get? Would you let your child witness, for the entirety of their lives, how robbed you felt? That your daughter was "stolen" from you? Would you let them think -- for even a minute -- that you didn't celebrate who your child really is? Be proud of your autistic child. Nurture them. Help them grow. Cherish the hell out of them. And, for the love of God, get out of your mourning, and LIVE life with your child. Your child hasn't been stolen, but you may be stealing your child's dignity and self-worth. I liked the idea of "throwing a fit because the car is the wrong colour". And then when I am in the parking lot trying to find all the grey cars which look like the Mothership and have bonnets and profiles. And in Australia there are three generations of Stolen Children. This really pushes my buttons and gets my goat. Archie Roach - "Took the children away".